24 January 2014. TUCSON, AZ – The International Dark-Sky Association (IDA) is proud to announce a new partnership with Celestron, one of the worldʼs leading telescope designers and manufacturers. In celebration of the upcoming event television series COSMOS: A SPACETIME ODYSSEY, airing on FOX and National Geographic Channel, Celestron is introducing the COSMOSTM 60AZ Telescope and partnering with IDA to help save endangered starry skies for generations to come. In support of IDAʼs mission, Celestron is donating a portion of the COSMOS 60AZ Telescope proceeds to IDA. Budding astronomers can tour the solar system with the beginner-friendly COSMOS 60AZ telescope, a longtime Celestron favorite that has been updated and upgraded for this exclusive partnership. To help grow IDAʼs membership and spread awareness about light pollution, every COSMOS 60AZ Telescope also includes a free one-year IDA membership. COSMOS: A SPACETIME ODYSSEY, set to premiere Sunday, March 9 (9:00-10:00 PM ET/PT) on FOX and Monday, March 10 (10:00-11:00 PM ET/PT) on National Geographic Channel, continues the adventure of Carl Saganʼs Emmy® Award- winning series “Cosmos: A Personal Voyage.” Celestronʼs partnership with IDA affirms its commitment to helping everyone experience the wonders of the cosmos. In the 34 years since the first “Cosmos” television series debuted, light pollution has increased to levels that deprive eight out of ten children in the United States and two-thirds of the world population the experience of viewing the Milky Way. Celestron and IDA want to change that. 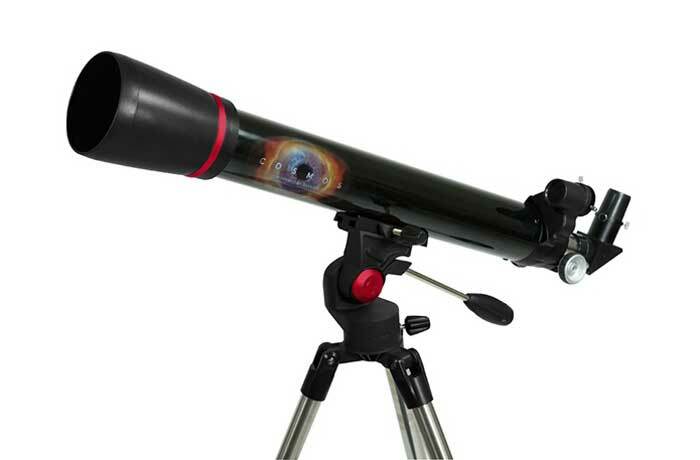 The COSMOS 60AZ Telescope will be available March 2014 at select retailers. Learn more about the COSMOS 60AZ Telescope and other COSMOS products at Celestron.com/cosmos. Celestron is a leading designer, manufacturer and importer of high-quality optical products including computerized and non-computerized telescopes and related accessories, binoculars, spotting scopes and microscopes. Celestron strives to inspire a sense of wonder, knowledge and fun in their customers and throughout their company. Learn more about Celestron at Celestron.com. COSMOS: A SPACETIME ODYSSEY is produced by Cosmos Studios, the Ithaca, NY-based company Ann Druyan co-founded in 2000, and Fuzzy Door Productions. Druyan and Steven Soter are the seriesʼ writers. Druyan, Seth MacFarlane, Cosmos Studios president Mitchell Cannold and Brannon Braga (the “Star Trek” franchise, “24”) executive-produce the series. Braga directs the series along with Bill Pope (“Spider-Man 2,” “Spider-Man 3,” the “The Matrix” franchise) and Druyan. “Like” COSMOS: A SPACETIME ODYSSEY on Facebook at facebook.com/COSMOSonTV. Follow the series on Twitter @COSMOSonTV and join the discussion using #cosmos. See photos and videos on Instagram by following @cosmosontv. The International Dark Sky Association, a 501(c)(3) non-profit organization based in Tucson, Arizona, advocates for the protection of the nighttime environment and dark night skies by educating the public on the subject of night sky conservation and promoting environmentally responsible outdoor lighting. More information about IDA and its activities may be found at https://www.darksky.org.